Reports in local newspapers such as the Malton Messenger tell us about accidents and other major incidents at the mines and on the railway. In March 1864 six trucks broke away on the incline above Hollins Mine. As the trucks plunged down the hill they caught a ticket house in which were two workmen. The hut was pushed over a precipice. One of the workmen escaped with just a few bruises, but the other man was killed. Later the same year a 20 year old man by the name of Robert Scarth was working in an open quarry at one of the mines. Ten or twelve tons of rock, probably dislodged by recent rain, fell and crushed him. Several workmen worked for two hours to reach the body, which “presented a sad spectacle”. A surprisingly frank description of Scarth’s injuries is given in the report. At a coroner’s inquest a verdict of accidental death was recorded. In April 1886 a 40 year old platelayer by the name of Stephen Smith was caught by a set of tubs while working on an engine plane at the East Mines. He was killed. 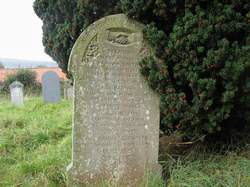 You can see his memorial in the graveyard at the parish church, which also records the deaths of his wife and two children. One of his children, Hannah Elizabeth, had died in 1878 at the age of ten months. Coroners investigating deaths in the mines were often expected to give a ruling about the proportion of blame that could be attributed to the negligence of the victim of the accident, and how much was due to poor safety procedures on the part of the company. I have not seen any reports in which it was ruled that the company held the main responsibility. Lists of known deaths at the Rosedale mines can be found on the website of the Durham Mining Museum. For information about the East Mines go to this address. Criminal offences were often reported in the local newspapers. They ranged from misdemeanours such as selling beer without a licence to serious crimes of violence. In April 1885 two miners, Alfred Cobbin and William Pratt, had a row while drinking together one evening at the Lion Inn. They left the pub separately but met again on the road home and renewed their altercation. Cobbin was knocked unconscious by Pratt, and did not regain consciousness until he came round in his own bed six days later. Pratt, who was apprehended by a Sergeant Spare, was held in custody on remand, but I have not yet found out what happened to him when he went to court. In September 1869 an incident at the East Mines resulted in the death of Abraham Allison, aged 20, an overlooker of the horse drivers. Allison ordered a driver, William Turner, aged 17, to help get a wagon back on the rails. When Turner refused Allison threatened to give him a snouter. Turner spent ten minutes meditating upon this, and then as he was passing Allison with his horse he suddenly turned round and struck Allison on the side of the head with an oak sprag. Allison suffered severe head injuries. He was attended by Dr Mail, assistant to Dr McKay, but died the following day. At court Turner pleaded guilty to the charge of manslaughter, and was sentenced to six months imprisonment. Google will give you the meaning of sprag. According to Richard Hankin a snouter can be roughly defined as a bloody nose.